Are you in need of Human Capital? Let OTD help you with virtual team members ON DEMAND. Business Process Outsourcing! What Kind of Team Members Does OTD Provide? OutsourcingThingsDone.com can provide you with virtual assistants, bookkeepers, legal assistants, computer programmers, web designers, customer service personnel, sales professionals, plus so much more. Pricing details here or drop us an email with your needs! OutsourcingThingsDone.com aka OTD takes the time to recruit and train your new team members. We build Teams, others place people. We recruit, others hire. We take the time to understand your needs, document them on video and recruit the perfect person to join your team. We also video interview the team member that we recruited for you and have them introduce themselves and speak to their experiences. For any supply chain function, the most significant decision is whether to outsource the function or perform it in-house. The decision to outsource is made at a strategic level and normally requires board approval. Outsourcing results in the supply chain function being performed by a third party. The process begins with the firm identifying the activity to be outsourced and generally using a make-buy analysis to justify the decision. Only once a high level business case has been established for the scope of services will a search begin to choose an outsourcing partner. Virtual Assitants can take on many roles within your business. Virtual assistant, data entry, customer service, live chat support, knowledgebase management, inbound email management, video transcription, audio transcription plus much much more. 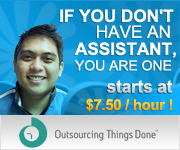 Get an OTD Virtual Assistant today. Let Outsourcing Things Done help you find lost time in your workflow. Contact us today!